Americans know how to cook vegetables — throw them in a pot and boil them until soft and tasteless, right? But by then, most of the nutrients are gone, and they taste like mush. No wonder a CDC report found that 87% of Americans ate less than the recommended 2–3 cups a day of vegetables. Most ate less than half that much. Now a new article by Sandee LaMotte on CNN.com explains five easy ways to cook vegetables so that they actually taste good and are far healthier than when they are boiled. There are hundreds of edible vegetables in about a dozen types. These include leave, stems, seeds, buds, tubers, sprouts, and several more I wrote about in this blog entry. Many vegetables are high in vitamins A, C, K, various minerals, and some B vitamins. They’re high in anti-inflammatory and antioxidant chemicals called “phytonutrients.” They generally have low glycemic index scores, so they won’t raise your blood sugar much. They are high in fiber, which has many benefits for diabetes you can see here. 1. Steam them. Steaming means cooking vegetables OVER boiling water, but not IN the water. You can buy a steamer or improvise one with a pot and a colander or strainer. You need to tightly cover the pot to keep the steam in, and use just enough water to create the steam, not soak the vegetables. You can see great steaming instructions with photos on this Wikihow page. A study from Zhejiang University in China compared the nutrition in broccoli after steaming, boiling, stir-frying, stir-frying followed by boiling, and microwaving. Steamed broccoli kept much more of its nutrients. Other studies found similar results in other vegetables, except for carrots. Somehow, carrots actually increased their content of beta carotene when boiled. With most vegetables, boiling leaches out the nutrients into the water, where they go uneaten. “As a general rule,” writes LaMotte, “it’s best to keep cooking time, temperature, and the amount of liquid to a minimum.” You can get some of the nutrients back by drinking the water or making soup with it, but steaming keeps the nutrients in the food. 2. Sauté. Sauté means to cook in a small amount of cooking oil. It’s similar to what Chinese cuisine calls “stir-frying.” It’s best to use healthy oils such as olive or canola oil, but you can use other kinds. Sautéing maximizes flavor, one reason Chinese food tastes so good. In addition, a small amount of oil “appears to increase the absorption of phytonutrients like phenols and carotenes,” according to dietitian Elaine Magee, author of the book Food Synergy: Unleash Hundreds of Powerful Healing Food Combinations to Fight Disease and Live Well. The reason is that many of the nutrients in vegetables are fat soluble. Our bodies can’t absorb them well unless there is fat or oil around, so cooking them in water is not as nutritious. For most vegetables, avoid deep-frying. The fat will absorb into the vegetables and dry them out. 3. Roast. 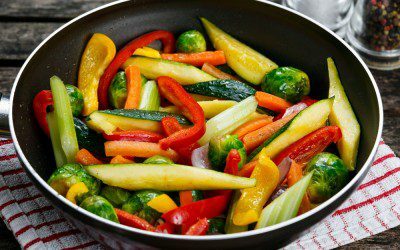 Roasting in an oven cooks at a higher temperature than boiling, so vegetables often come out tastier. Just cut them up, toss with a little oil, and roast. Most vegetables including tomatoes become more nutritious when roasted. There are exceptions, such as green peppers. Here are some general instructions for roasting veggies. It’s worth looking up recipes for roasting specific vegetables to learn the best temperature and time for each one. 5. Microwaving. Some vegetables like cauliflower don’t do well in microwaves, but for most veggies, it’s kind of like steaming. Pour a small amount of water in a microwave-safe dish, cover, and cook for a short amount of time. Too much water or too much time turns vegetables to mush, but small amounts will leave them tasty and nutritious. Eating vegetables raw is not usually best. Cooking breaks down the insoluble fiber. This softening makes it easier to absorb nutrients from cooked vegetables than from raw ones. This is part of the evolutionary miracle of cooking, which enables people to eat so much better than animals, most of whom are lousy cooks. We can get a lot more nutrition out of food with a lot less effort. Of course, an occasional salad or raw sprout or something is not bad. For any of the five methods here, you can use seasonings and combine vegetables that look good together, and you will have a great-tasting dish. You might not even want starchy or sugary foods after eating them. Feeling inspired to try some of these cooking methods? Diabetes Self-Management’s Asparagus with Lemon & Mustard, Light Lemon Cauliflower, Roasted Butternut Squash, and Quick Zucchini Parmesan recipes are good places to start. When things go wrong, asking “why” often makes it worse. I wrote about when and why not to ask on my blog The Inn by the Healing Path.